It is Easter time, and with the season comes many special flowers that bring joy and a sense of spring. 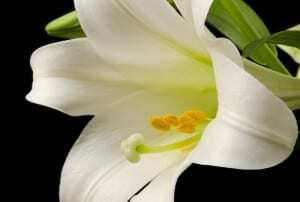 Easter Lilies aren't dangerous for dogs or humans, but they are quite poisonous to cats. Each part of the Easter Lily is toxic to cats: leaves, stems, petals, and pollen. If you see your cat licking an Easter lily, or nibbling a leaf, call the vet. Also be observant on pollen falling from the flowers - cats can ingest this while grooming themselves, and even such a small amount can lead to severe kidney problems or kidney failure. Some cats also stagger, become disoriented, or suffer seizures. If your cat ingested any part of an Easter lily, it needs treatment at once. There aren't any antidotes to lily poison, and the vet will administer drugs to bind the poison and give intravenous fluids to flush out the kidneys. They will also monitor the kidneys through blood testing. If the cat gets treatment quickly, all this will be easier on both the pet and your wallet. Other types of lilies known to be poisonous to cats include Tiger lilies - common in yards - Day lilies, and Asiatic lilies. Amongst lilies that usually do not pose a problem to cats we find Peace lilies, Calla lilies, and Peruvian lilies. It's always a good idea to keep the numbers to your regular vet and pet emergency rooms saved in your phone and written down somewhere you can find it even in a time of stress.